Is it possible to connect Qumi to a game console, such as a Microsoft® Xbox or Sony® PS3? Yes, Qumi can be used to display content from an Xbox or PS3 console. This can be done by connecting the HDMI cable from the game console to Qumi. Can Qumi project television content from cable or satellite? Watching television content can be done by connecting a cable box, digital set-top box or satellite receiver directly to Qumi. For example, if a cable box is used, it can be connected by an HDMI cable to Qumi. How are images from a digital camera or a USB storage device displayed? 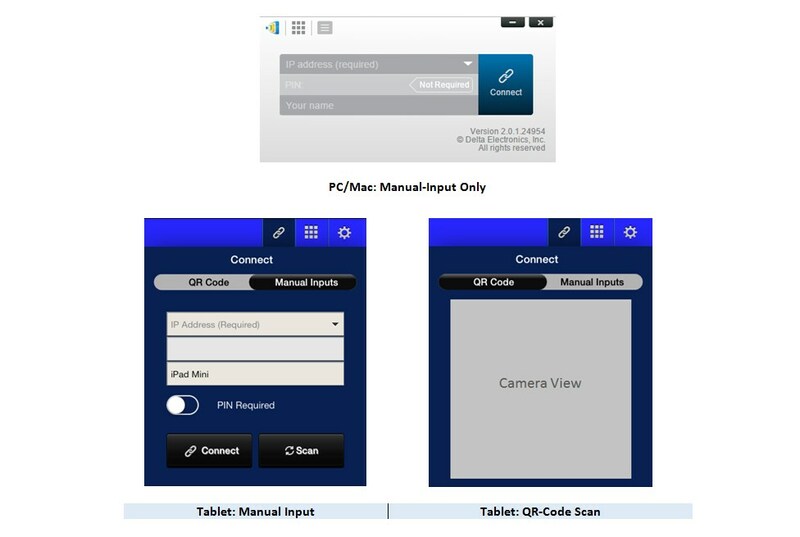 Once the devices are connected, images can be displayed by using Qumi Media Center on the Splash screen. I lost my remote. Where can I get one from? Contact your Reseller or Vivitek via www.vivitekcorp.com and selecting your region, to obtain another one. Which cable is required for video devices to be connected with Qumi? Video devices can be connected to Qumi by using HDMI or MHL cable if the devices contain the appropriate ports. What type of video formats does Qumi support? What type of audio formats does Qumi support? What type of document formats does Qumi support? Microsoft® Office 97-2010 (Word, Excel®, PowerPoint®), Adobe® PDF (1.0, 1.1, 1.2, 1.3, 1.4). What type of photo formats does Qumi support? How long will the LED light source in Qumi last and can it be replaced? Qumi does not use a typical light source. It uses a set of Light Emitting Diodes (LED) to illuminate and project images. LED’s have a greater lifespan than conventional lamps. Qumi LED’s are estimated to last for approximately 30,000 hours. The lifespan of the LED depends on factors such as brightness, usage, environmental conditions. LED brightness can decrease over time. The LED module is not replaceable. Why do I need to re-adjust the focus on my Qumi after it’s powered up? For the best picture quality, adjustment of the remote controller’s Zoom-In (+)/Zoom-Out (-) Keys may be necessary once the operational temperature has been met. I lost my remote on my Qumi, how do I select inputs? Press and hold the right or left arrow key for 3 seconds, and this will bring up the input menu. Use up and down arrow keys to select input. Press enter key. NovoConnect is a wireless projection and collaboration device. 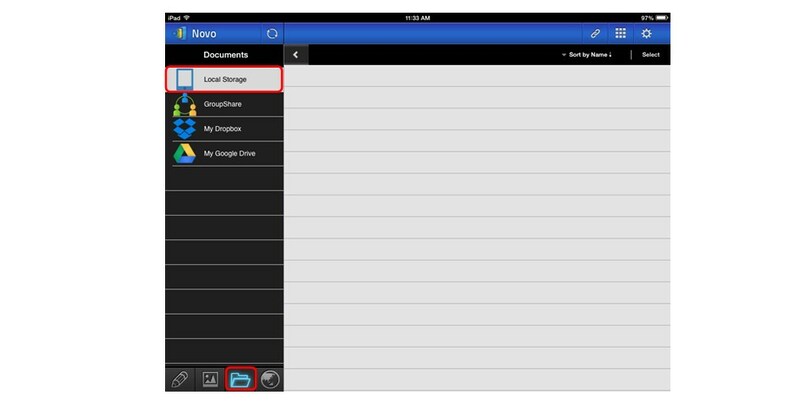 Teachers can use it to organize student activities in a BYOD environment in classrooms. Companies can use it to facilitate interactive and engaging discussion in meeting rooms. Can I connect NovoConnect to an LCD monitor? Yes, you can. As a matter of fact, you can connect NovoConnect to any display equipment with an HDMI port or a VGA port (via an adaptor). What display resolutions does NovoConnect support? 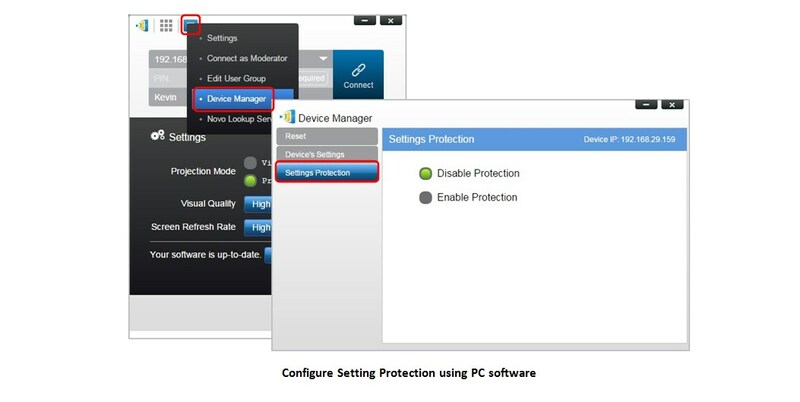 Connect a USB mouse and then you can configure the NovoConnect device with ease. What types of PCs or tablets will work with NovoConnect? 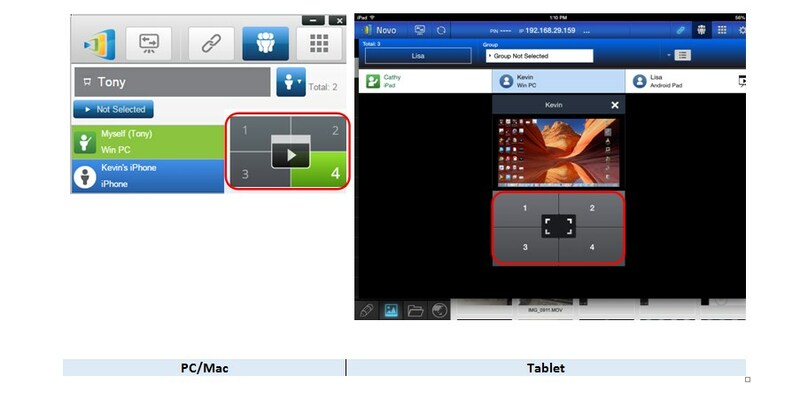 NovoConnect supports a variety of devices, making it perfect for BYOD environment. How many users can connect to a NovoConnect device at the same time? 8 users when the NovoConnect device is configured as a WiFi Hotspot. Is my data secure when I use NovoConnect to share my screen? 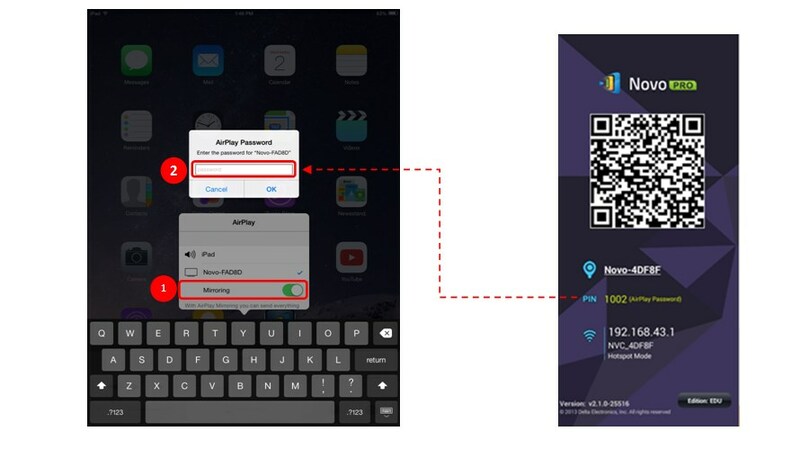 Yes, your data is encrypted using AES-128 encryption to ensure data security when you set NovoConnect to “Corporate” mode. Can I use the USB port in the back of my projector to power the NovoConnect device? As long as the USB port can supply 750mA, it is going to work. My projector only has a VGA port. How to make it work with NovoConnect? Both software are free of charge. I have set up my NovoConnect device properly for my organization. Is it possible to “lock” its setting parameters so that nobody else can change them by accident? 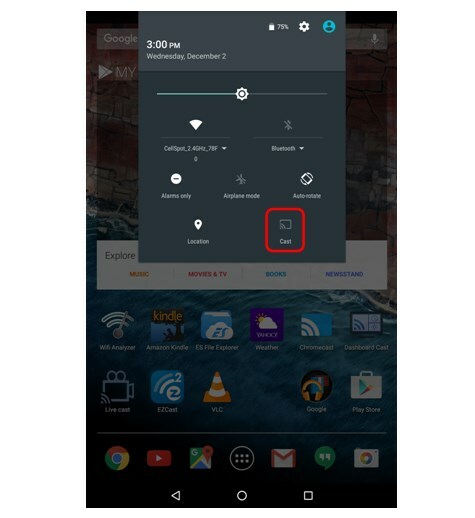 What are Hotspot mode and Client mode? What are their difference? 1. Hotspot mode – The NovoConnect device creates its own WiFi network. You need to connect your PC or tablet to this network to work with this NovoConnect device. 2. 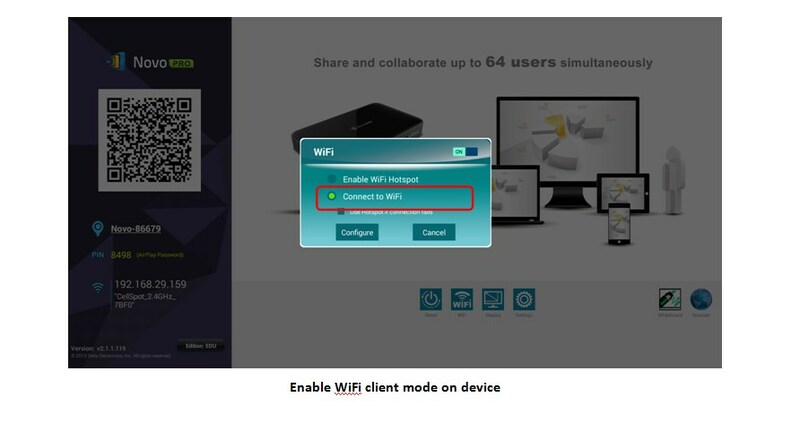 Client mode - The NovoConnect device connects to the same WiFi network as your PC or tablet connects to. Typically it is your school or company’s WiFi network. 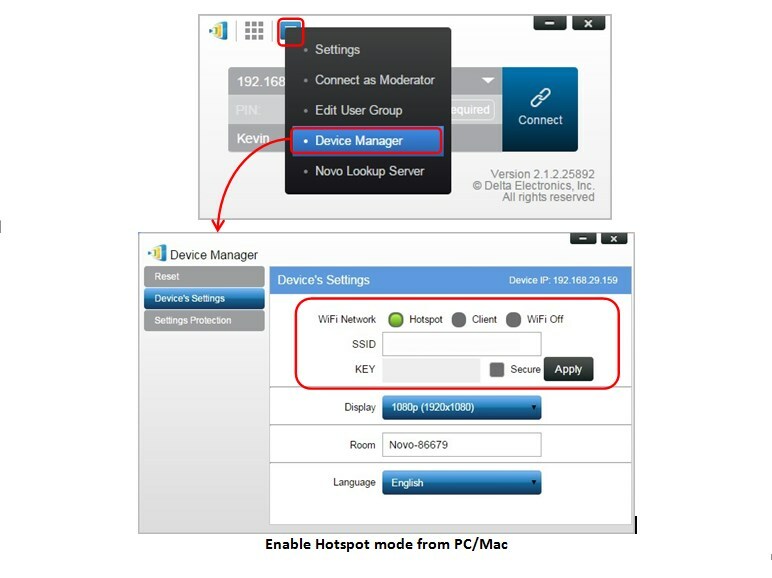 How to enable my NovoConnect device in Hotspot mode? Can I browse the Internet when I connect to my NovoConnect device in Hotspot mode? How to connect a NovoConnect device to my WiFi network? You can set up the WiFi connection from PC/Mac or on the device. It is worth mentioning that, a check-box, “Use Hotspot if connection fails”, is added to firmware version 1.5. 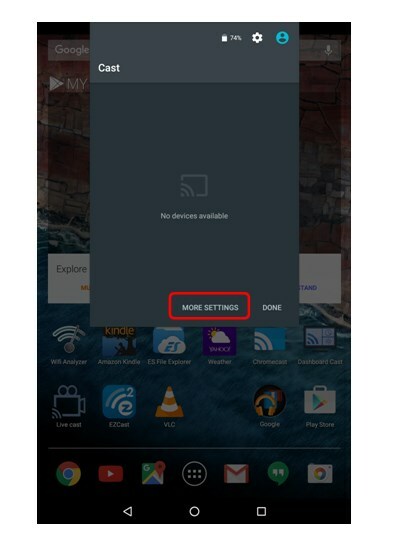 When unchecked, the NovoConnect device will not switch to WiFi Hotspot mode. Instead, it keeps monitoring the WiFi spectrum. 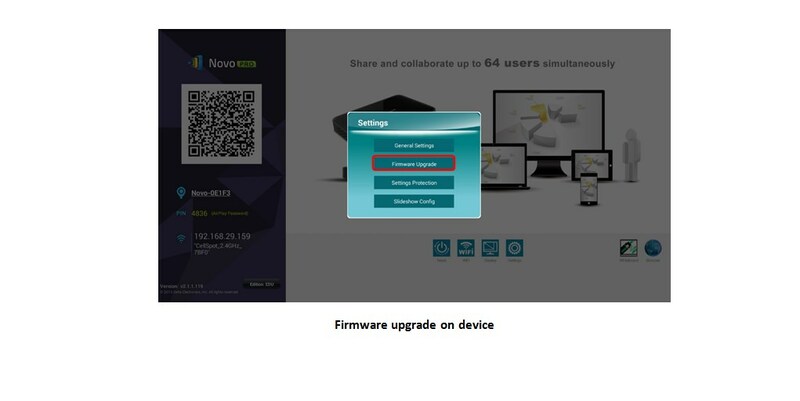 Once the WiFi router is back online, the NovoConnect device will re-connect automatically. I have connected my NovoConnect device to my school’s WiFi. However, it doesn’t seem to work. I can’t connect my PC or Tablet to it. I connected my NovoConnect device to my school’s WiFi a few days ago. This morning I notice that it switches back to Hotspot mode by itself. What happened? How to connect or log into a NovoConnect device? I can’t connect to the NovoConnect unit either by scanning the QR code or entering its IP address. I have connected to the NovoConnect device but my screen is not shown on the projection. What should I do? After you are connected, click the user-list icon, (highlighted in RED in the left figure), to view the status of all users. Users with icon, , are actively projected on the screen. You may need the host/moderator to show yours. Can I hand over my host/moderator to someone else? We continuously upgrade our software to enhance user experience as well as to introduce more product features. You will be able to upgrade the PC/Mac and Tablet software, as well as the device firmware. All software upgrade will be free of charge. There are two ways to do so. 1. You can visit http://www.vivitekusa.com/novoconnect/ to download the latest software. 2. Connect you PC/Mac to the Internet. Launch “Desktop Streamer” and it will search for upgrade automatically. How to upgrade my NovoConnect device? 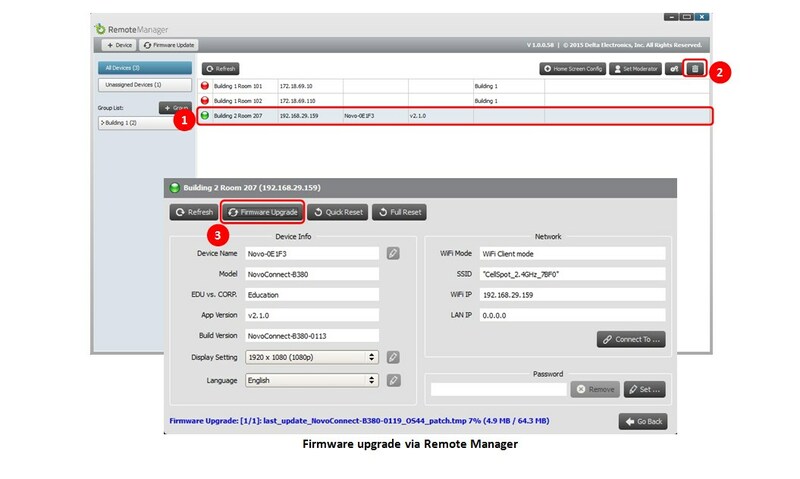 You can initiate the device firmware upgrade from PC/Mac or on the device. A white-board module, which allows you to use tablet as an electronic white-board In the coming months, we are going to release new versions with more exciting features. You will be able to play your local or Youtube video to your audience via NovoConnect. As teachers, you will have a polling feature at your disposal to access student responses instantly during class. How to share video via NovoConnect? For local video clips, find the desired clip and you can start the playback via “tapping”. For YouTube clips, use the built-in web-browser to find the desired clip. Then press the “YouTube Sharing” icon at the top-right corner to start the playback. Can I mirror my iPad screen? No, not at this point. However, you can use other software to do so, like AirServer or Reflector. Here are the steps: 1. Install AirServer or Reflector on your PC or Mac 2. 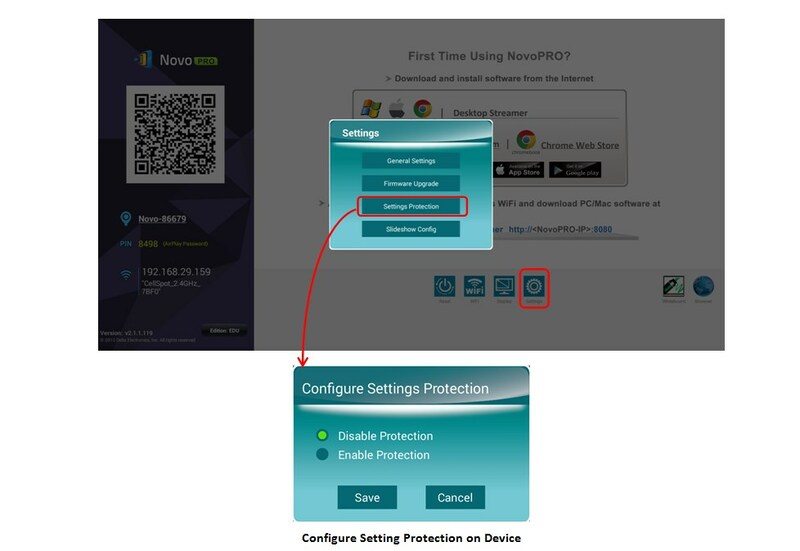 Connect your PC or Mac to your NovoConnect device 3. 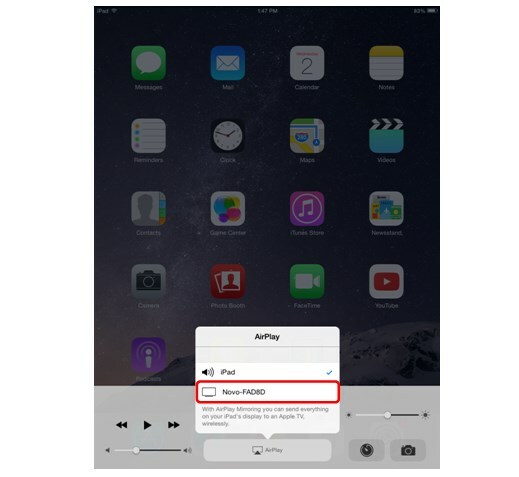 Now, you can mirror iPad screen to your PC or Mac, which, in turn, will show up on the projection screen vian your NovoConnect device. 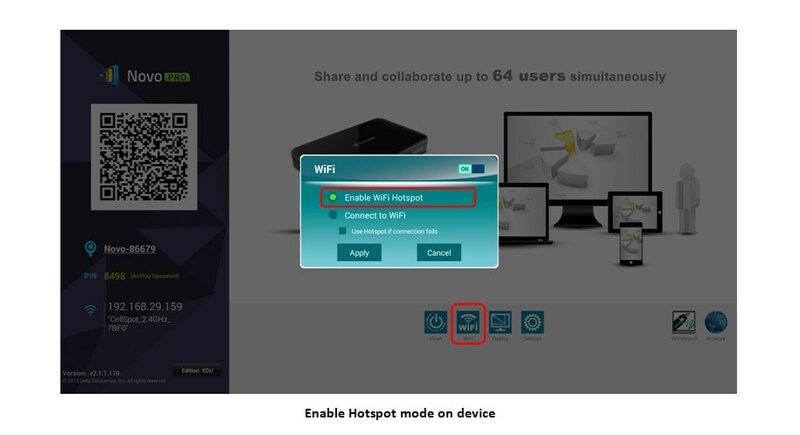 (1)	Hotspot mode – The NovoPRO device creates its own WiFi network. You need to connect your PC or tablet to this network to work with this NovoPRO device. 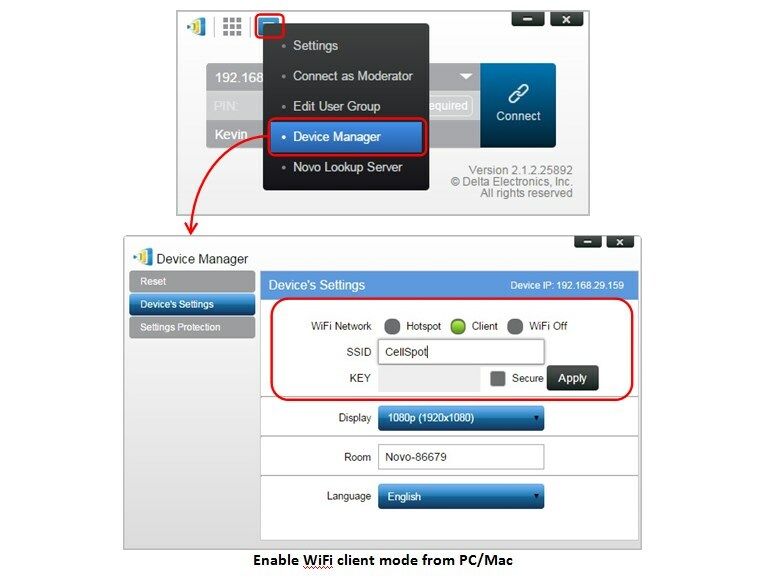 (2)	Client mode - The NovoPRO device connects to the same WiFi network as your PC or tablet connects to. Typically it is your school or company’s WiFi network.